RAVEN'S EVE was painted in 2005. It is one of the last pieces in my 'dark' period, where I painted many vampires, gothic heroes, and my palette consisted of many reds, blacks, blues, and more blacks. She will be available until my birthday on November 19, 2014. RAVEN is a character I designed in high school, who followed me all the way out of college. She was created after viewing the movie "The Crow", and was my way to express the depression and loneliness I was feeling at the time. Most teens do. Since her beginning she has come a long way. Raven lost everything very young, including her soul. She spent years searching for purpose, looking for a way to fill the void within her heart, but finds no relief. She is immortal, but not fully vampire. She was human, but now there isn't a word for what she is. Raven has been a hired assassin...as her void and depression allow her to null out the emotions, and she has fought for justice as well. She is neither good or evil. This character is no longer needed in my life. I found the missing piece I was searching for, and it was and is Jesus. Love. When I painted this piece I was starting to transition from a practicing witch to a practicing follower of Christ. Surprisingly, it wasn't that big of a leap for me, as my story led perfectly into His. 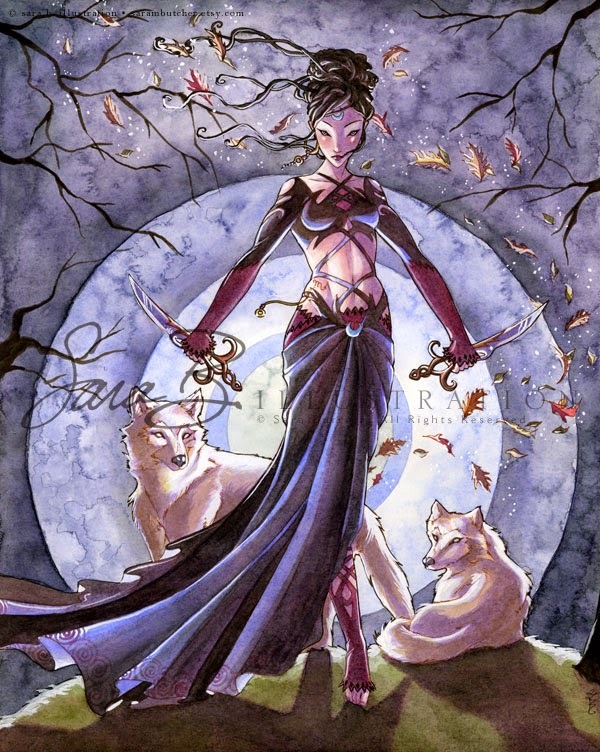 The piece RAVEN'S EVE symbolizes her strength and confidence in who she is at the time she was painted. The wolves symbolizing gentleness, wisdom, and maybe some purity. The daggers...well....we all sin every day and they represent that. But also death, death to the old self...the self that has already been dead for so long. I liked your "Raven" character and was dubious at first until I read our blog. I am sure glad you found your purpose in Jesus. I have a small book which I wanted to publish, (probably privately, unless you know of something different.) about my grandson when he was 3, on Christmas Eve. I would send you a copy if you would be interested in seeing what we might be able to accomplish together. I wanted someone who holds true to the Christian faith and be able to bring the meaning out in symbols, imagery and love. Thanks so much.